This short Lake District walk up Stickle Ghyll to Stickle Tarn takes in dramatic waterfalls and spectacular Langdale views – and promises a cracking pint at journey’s end. 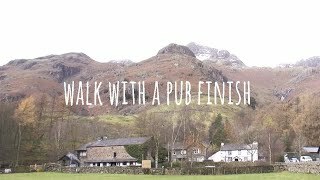 The National Trust’s Sticklebarn pub in the Lake District’s dramatic Langdale Valley sits at the heart of miles of fabulous walking routes and is the perfect resting spot after a long day out on the fells. With the pub your start and end point, this short route follows a steep but well-defined path running all the way along Stickle Ghyll side up to the rewarding sight of Stickle Tarn at the top. Spectacular scenery along the way will give you plenty of excuses to take a breather to wonder at the picture-perfect waterfalls and rock pools cut into the mountainside. Rest a moment too to take in the striking views across the valley to Lingmoor. On the route you’ll cross the hydro scheme that supplies electricity for Sticklebarn – part of the National Trust’s wider plan to source 50 per cent of its energy use from renewable schemes on land it looks after by 2020.